Shokran Mortga, actress, Syrian nationality, Palestinian origin, was born on December 12 1970 in Taif in Saudi Arabia. Full report on the life story of Shukran Murtaja, biographical information from Wikipedia and the latest news. Full real name: Shukran Abdul Wahab Murtaja. Date of birth: 12 December 1970. Place of Birth: Taif, Saudi Arabia. Years of work: 1993 - present. Husband: Alaa Qassem bin Jaber. Shukran Murtaja was born in 1970 in Saudi Arabia. In the secondary stage she participated in the acting activity in the theater of the school, and her first position on the stage through the play "Pharaoh does not resemble the Pharaohs," and after finishing high school I joined the Higher Institute of Dramatic Arts. 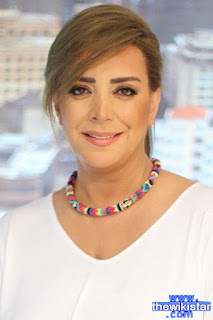 Shukran Murtaja started acting in 1993, and her first television career was when she was chosen by the great director Haitham Hakki as Zakia's role in Khan al-Hariri. And then followed her television and varied roles in drama and comedy, the most famous "Diary of Jamil and Hana" and "Saqr Quraish" and "Bab Al Hara", until it became one of the most famous and most important dramas of Syria. Shukran Murtaja also presented several television programs including "Shukran Ya" on Syria Radio Al Ghad, "Star FM" on Radio Syria Al Ghad, and joined the team of "Salafna Helwa" on Dubai TV.